Good news: Today is my birthday! (That’s not me. 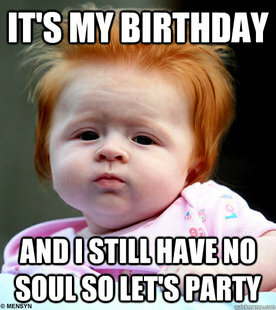 But obviously I was a ginger baby). I’m 28. That feels kinda old. But as my dad says, “Getting older is better than the alternative!” Ha. Anyway, a few weeks ago, I saw this post at Healthy and Happy Hour, and I decided to do it, too. I only have two years before I turn thirty. This is a list thirty things I want to do in the meantime. Some of them are big achievements and some are small, but they’re all things I’d like to accomplish. This was surprisingly difficult to write and took me a few weeks. I kept wanting to write things like “become a better teacher” or “be a better friend,” but those aren’t really a cross-off-the-list-able goals (because when do you know you’ve accomplished them?). Here are my 30 goals. Hold me to them! Learn to can and freeze fruits and veggies. My mom and grandma preserved fresh produce every summer when I was young, and I never paid attention to how they did it. Now that I have a house with a big enough pantry and a deep freeze, I want to put up my own stuff – cheaper and healthier than store-bought. Attempt to get published in an education journal. I submitted an article a couple of years ago, at a grad school professor’s request. It got rejected, and then I was scared to try again. Time to get over it keep trying. Run a 3-hour marathon. That’s besting my PR by 13 minutes. Ambitious? Yes. But isn’t that the point of making a goal? Save money and get better at sticking to a budget. Put in a beautiful backyard. We bought this house last May, and the backyard was completely bare except for a big tree. We’re planning to get sprinklers and sod in this fall, then work on flowerbeds, etc. It’s more like a five-year (or more) project, but In two years’ time, I’d love to have an inviting backyard that’s great for entertaining, playing, and relaxing. Visit my grandparents more. Like my parents, my grandparents live on the other side of the state, 6+ hours away. Unlike my parents, my grandparents don’t travel, so I only see them 2-3 times a year (the school year and those pesky Rocky Mountains make travel hard from August-May). I need to make the trip a little more often and spend time with them while I still can. Make more local friends. My college roommates are still my best friends in the world, but we aren’t physically close anymore. Meeting new people is not easy for me, as I’m naturally introverted, and it took me a long time to make friends here. I’d like to keep meeting people and expanding that friend circle. And continue growing the friendships that I have. It gets hard to see even local friends with everyone’s busy schedules. I need to be better about making it a priority. Hang out with our neighbors. I lived in the country growing up, so I had this idea that in town, everyone on the block would know each other, come over for barbeques, chat while getting the mail, etc. That hasn’t really happened here. I’d like to get to know our neighbors better over the next couple of years. Volunteer. Every year in about April, I say I’m going to volunteer somewhere for the summer. And every year, it’s suddenly the end of July and I haven’t done it. All the while, I exhort my students to volunteer as much as possible. Hypocrite much? Run the stairs at Red Rocks. This is a quintessential Colorado thing to do, but since I live almost two hours from Red Rocks, I’ve never done it. But I will sometime when I stay with Denver friends or family. Go white-water rafting. I keep seeing all these blog posts about it, and every time we drive I-70 in the summer, there are a ton of people out on the river. It looks fun, and I want to do it, too. Get a new computer. Sweet goodness, I hope this happens in the next two years. This baby is seven years old, which is 87 million in computer years, and it’s slow as my husband molasses. Go on a girls’ trip. My three college roommates and I try to get together a couple of times a year, but it’s getting harder and harder with jobs, marriages, babies, etc., and it’s been too long since all four of us have gotten together. Let’s do it, ladies! Go to California. We have a lot of reasons to go out there –friends, family, wine, the ocean (see #4). Buy a china cabinet. When we moved into this house, our wedding china finally got to move out of my in-laws basement and into our house. I’ve even used it once, when we hosted Thanksgiving. But it’s living in a closet and isn’t very easy to get to; I’d love to get a real china cabinet to keep it in. Run a race with my brother. And his girlfriend if she wants to. We’ve done a couple of races together – we don’t run together, but we hang out at the start and finish and cheer each other on– and it’s fun. We haven’t done one for a couple of years, and I think it’s time for another. Get a massage. I’ve only had one in my life and the whole naked-rubbing-by-a-stranger thing creeped me out. I should try again because everyone else loves them and they’re good for runners. Restain our deck. Because it needs it. Badly. Eat at Fruition. Fruition is a Denver restaurant that is said to be amazing. I’ve wanted to go there for a couple of years and can never get a reservation. Find or invent a tofu recipe that my husband will eat. Visit the wildlife sanctuary in Hudson. About an hour away from us is a wildlife rescue with tigers, lions, etc. Everyone says it’s worth going to, but we have never gone. Hike into the Roubideau Canyon with my family. This is the canyon I talked about here. Dad and I hiked it when I was eight; it’s one of my fondest memories. I’d love to go back down there and see if there are still lots of little fishes in the stream at the bottom. Take our nieces on a mini-vacation. J and I have three nieces. The two oldest are starting seventh grade and the youngest is starting second. As they get older and busier, it’s getting harder and harder to spend quality time with them. I’d love to take them on a weekend aunt-uncle-kids getaway. Go rock climbing either outdoors or on a wall. My friend from college keeps a really cool blog, and she’s always posting about rock climbing. It looks uber fun. I want to try. Go for a trail run. Because they’re the best, and happen far too little for me. Stand up on waterskis. I’ve only tried waterskiing once – last summer with my in-laws. I swallowed a lot of lake water and didn’t actually ski. But I will do it eventually! Go to Pawnee Buttes. Another local spot that we’ve never ventured out to. So those are my goals for the next two years. I know that was lengthy; if you made it this far, thanks! Any advice to help me meet these goals? What are some of your upcoming goals? If you do a post like this, link to it in the comments — I’d love to read it! Happy Birthday! Love the list! One of my Grandpas lived in Colorado. I had the opportunity to visit him one summer and go white-water rafting. It’s definitely worth it!!!! Plus you live in the perfect state for it! P.S. Let me know if you come out to L.A. anytime soon. Maybe we can have a blogger meet-up! Well…HAPPY BIRTHDAY!!!! And those all sound like some wonderful goals and definitely achievable in the next two years!! My dad’s a motivational speaker and some of what he does is goal setting…his advice is always to print out your list and put it somewhere you will see it every day (on your mirror, on your fridge, next to your desk, etc) to help remind yourself all the time of what you want to accomplish. You can cross off some trail running AND the Red Rocks stairs all at once because there are some great trails that run around the amphitheater. I know that they also have fitness days on the Rocks, so you can join one of those while you’re at it! I’ve always wanted to attend one! I was SO CLOSE to signing up for one of those a few weeks ago, but we had other plans and I didn’t think I could make both work. Maybe next time! I love reading about people’s goals!!! When I turned 20, I made a list of things I wanted to do before I turned 30. I have about half or so crossed off but I am working on the other half…I have about 4.7 years or so! I think making this list would have been easier if I started it when I was 20! I kept putting things like “Go to Europe,” and then I thought…wait, that’s only two years away. I’m not going to get more pay by then, haha. Happy Birthday to you love! This 30 before 30 list is inspiring and downright awesome. Great goals and they’re all achievable. I would pick a few each season. Write them down, put them on the fridge so they look at you every day and do them. It’ll seem less daunting if you break them up. We print out our new years resolutions every year and do the same thing. It’ll be awesome to hear about you checking them off the list! Breaking them up is a great idea! Thanks! I should have put skiing on my list! I’ve lived in Colorado my whole life and have never skied. Oh you need too! Living in FL we don’t have many opportunities to ski (other than water :)) but its my absolute FAVORITE activity! HAPPY BIRTHDAY fellow leo! I love the list and I think it’s a great way to meet some of the goals you’ve set for yourself. I’m looking forward to reading you accomplish them!